Ramadan ended a bit ago, so I’m a little late in sharing some pictures I made a while ago at a community gathering to break the fast together. © 2012 by The York Daily Record/Sunday News. 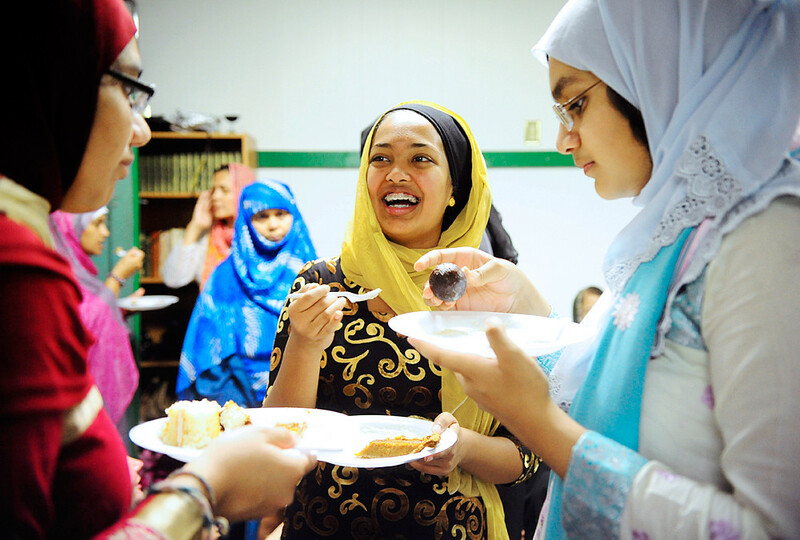 (Left to right) Hira Ahmed, 13; Ohanna Mohammad, 13; and Sanya Ahmed, 12, all of York Township, eat dessert together in the women’s section in the Masjid At-Tawheed mosque on Saturday, July 21, 2012. 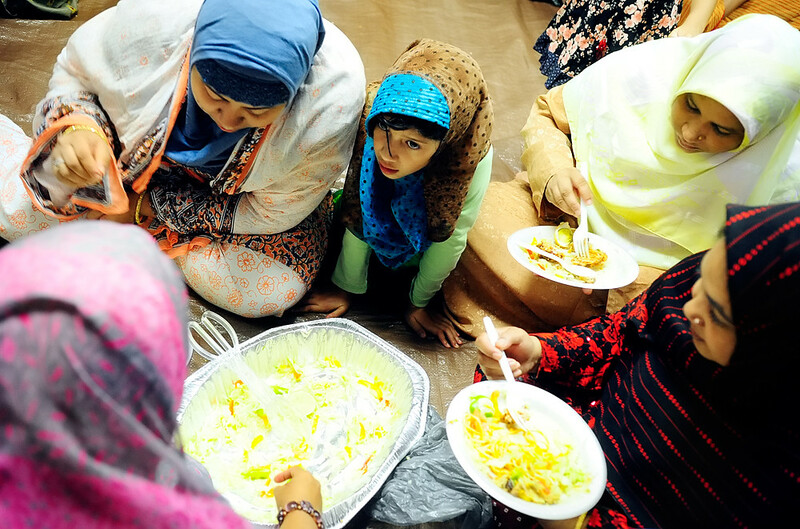 Sunni Muslims in the York area gathered for communal dinners each Saturday during Ramadan at Masjid At-Tawheed in York, for the breaking of the fast. I’ve made pictures of Muslims before, but it was always in a public, diverse setting. This community gathering was the first time I was in an exclusively Muslim setting, so I had to learn quickly about various cultural differences that were complicated by my being female and having a camera. Fortunately, several men and women helped me tread the waters, and I think I was able to produce some good frames and, more importantly, some goodwill among the community. © 2012 by The York Daily Record/Sunday News. (Left to right, starting with the pink hijab) Runi Yasmin of York Township, Shaika Rizal of Mechanicsburg, Yasmin’s 9-year-old daughter Ibnat Irteeza, Beauty Ishaq of York and Kamrun Nahar of York break fast and eat dinner together in the women’s area in the Masjid At-Tawheed mosque on Saturday, July 21, 2012. © 2012 by The York Daily Record/Sunday News. Abul Hasan of Springettsbury Township helps serve the men and boys at a communal dinner to break the fast during Ramadan on Saturday, July 21, 2012, at the mosque Masjid At-Tawheed. © 2012 by The York Daily Record/Sunday News. Ibna Irteez, 9 of York Township, sits in the back of the women’s section as the older women prostrate in prayer at the conclusion of a communal dinner to break fast during Ramadan on Saturday, July 21, 2012, at the mosque Masjid At-Tawheed.